As some may have noticed, a large portion of my Samba 4 work during the last few months has been focussed on adding Python bindings for our various public libraries and the refactoring necessary to make it possible to add Python bindings. So far, we have bindings for LDB and TDB but I intend to add bindings for most of our public API so it is possible to, for example, open Windows registry files, join domains, etc. from Python. LDB is our LDAP-like embedded database, and is for LDAP what sqlite is for SQL. Last night I decided to see how hard it would be to write a graphical browser for LDB using Python, and it turned out to be quite easy, thanks to PyGTK. There is a screenshot of what it looks like here. Packages with the Python bindings for LDB are already in Debian. 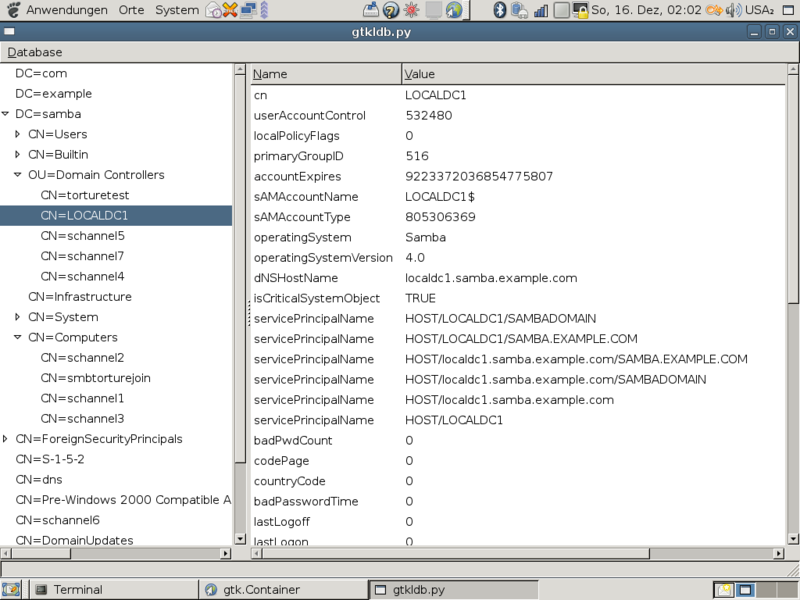 The sources for gtkldb are available in the samba-gtk bzr branch at http://people.samba.org/bzr/jelmer/samba-gtk/trunk, along with some of the GTK+ frontends for Samba 4 I wrote earlier (gregedit, gwcrontab, gwsvcctl, gepdump and gwsam).